Used exhaust manifold. Manifold is casting #24506309, and is RH (passenger) side, and has provision for EGR port. Manifold is in good condition. There are no broken studs and is not cracked. Sold as shown. "Dorman Exhaust Manifold --. 2 Exhaust Manifold Kits. Notes : Kit components - 2 Exhaust Manifold Kits. Quantity sold : Set of 2. Condition : New. WARNING: This product can expose you to chemicals including Nickel, which is known to the State of California to cause cancer. EXHAUST MANIFOLDS. front bumpers. if you need it faster no problem. If you are not. We try our. condition unless noted. on here I’ll be happy to list it for you. © The Junkyard AR. "Dorman Exhaust Manifold --. 2 Exhaust Manifold Kits. Notes : Kit components - 2 Exhaust Manifold Kits. Notes Location : Front and Rear. Location : Front, Rear. Quantity sold : Set of 2. Condition : New. "Dorman Exhaust Manifold --. Includes : Two studs, two nuts, and one manifold gasket. Series : Dorman OE Solutions. Under NO circumstances will our liability exceed the amount of the original sale. General Warranty Limitations (Applies to all Product Warranties). His Hedders have been in demand by top engine builders and racers since the start. "Hedman Headers --. HEDMAN – HI-TECH COATING (HTC) HEDDERS. Series : Hedman HTC Hedders. Quantity sold : Kit. Condition : New. Apart from having separate tubes for each cylinder to eliminate backpressure due to interference between exhaust pulses, a properly designed header can actually increase engine efficiency, helping to draw more air/fuel mixture into the combustion chamber through a process known as exhaust scavenging. "Victor Reinz Exhaust Manifold Gasket --. Quantity sold : Set of 2. Therefore all implied warranties that may apply to your part are limited to the duration of this written warranty. Each warranty gives you specific rights, and you may have other rights which vary from state to state. HANDS DOWN HARDEST THING TO FIND IS NOS EXHAUST! DONT MISS OUT! Front and rear turbo manifold ( crossover pipe bolts in between, Not included, manifolds only. 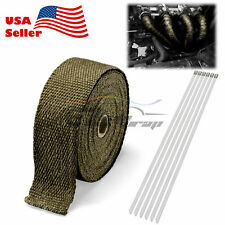 Great for running a factory GM turbo kit on your V6. Over all good condition. ). Used exhaust manifold. Manifold is casting #10182321, and is LH (driver) side, and has. 2001-2003 Pontiac Aztek with 3.4L V6 OHV engine. NOTE : ALWAYS match your casting # to ensure you order the correct part. "DNJ Exhaust Manifold Gasket --. Quantity sold : Set of 2. Therefore all implied warranties that may apply to your part are limited to the duration of this written warranty. Each warranty gives you specific rights, and you may have other rights which vary from state to state. See product for application and installation details.". Series : Hedman Painted Hedders. "Hedman Headers --. HEDMAN HEADERS. Color/finish : Painted Black. Therefore all implied warranties that may apply to your part are limited to the duration of this written warranty. Maximizer High Performance™ Stainless Steel Headers (4pcs). 2008-2009 Buick LaCrosse Super Sedan 5.3L. 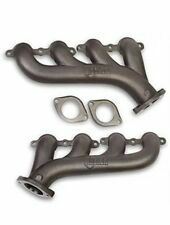 This header increases exhaust flow at higher RPMs to generate more power and maximize performance out of your engine. Maximizer High Performance™ exhaust headers feature high-performance straight-flow technology to unleash the engine's maximum horsepower. Maximizer High Performance™ exhaust headers are individually hand built from highest grade materials. When cylinders don't have to fight with each other to expel their exhaust, they can put more power through the wheels, pushing the vehicle. Combining with a high performance cold air intake, and a cat-back exhaust system, a header system removes all restrictions of your engine, then, it is able to perform at its full potential.